(Nanowerk News) Researchers at Missouri University of Science and Technology are giving new meaning to the term “read the fine print” with their demonstration of a color printing process using nanomaterials. 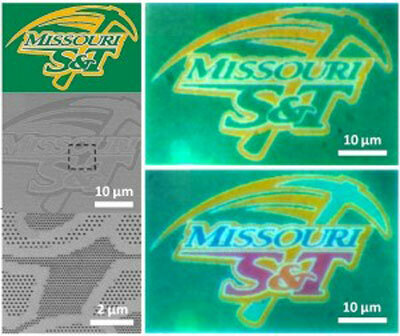 The researchers describe their “no-ink” printing method in the latest issue of the Nature Publishing Group journal Scientific Reports ("Structural color printing based on plasmonic metasurfaces of perfect light absorption") and illustrate their technique by reproducing the Missouri S&T athletic logo on a nanometer-scale surface. Missouri S&T researchers have developed a method to accurately print high-resolution images on nanoscale materials. They used the Missouri S&T athletic logo to demonstrate the process. At top left is the original logo. At right are examples of the logo printed at the nanoscale level. The method described in the Scientific Reports article involves the use of thin sandwiches of nanometer-scale metal-dielectric materials known as metamaterials that interact with light in ways not seen in nature. Experimenting with the interplay of white light on sandwich-like structures, or plasmonic interfaces, the researchers developed what they call “a simple but efficient structural color printing platform” at the nanometer-scale level. They believe the process holds promise for future applications, including nanoscale visual arts, security marking and information storage.